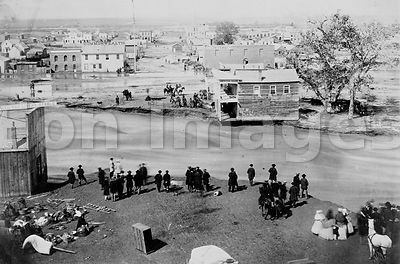 When I started accumulating historic weather event images lately, I didn't imagine that Eon's home, Boulder County, Colorado, would soon see such calamitous weather. 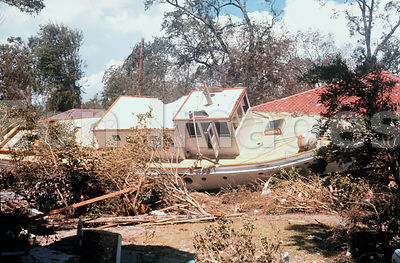 I have added a few images to Eon's In the News collection. As is our policy, images in this gallery are available to download, free of charge and without watermarks, at all resolutions during the month of the news events. Here's one picture from the group of images depicting what our fellow residents of Colorado are experiencing this week. 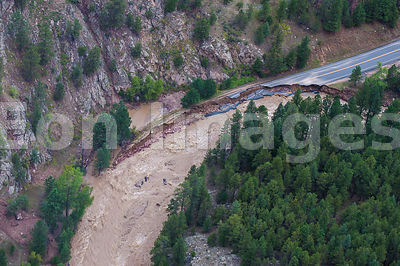 Damaged roadway adjacent to the Big Thompson River following days of torrential rain, Sept. 14, 2013. New on Eon is Weird Weather, a gallery we will be adding to frequently for the rest of the year. As we are in the midst of hurricane season, we have added a number of subgalleries related to famous--or infamous--storms of years past. We have a lot to add to this category, so check back frequently! Hi! This is a placeholder blog for Eon Images, your source for royalty-free and public domain historical images. As you may have noticed, we haven't updated our news blog lately. We are testing new looks and content, and will try to update this section of the site soon. Feel free to browse our previous content. Visit www.eonimages.com to download affordable historical and contemporary pictures, or for picture research, permissions, proofreading, and editorial services. This week we augmented our Hinduism gallery with 30 black/white and sepia photographs of Hindu sculptures, carvings, temples and holy people. Stay tuned for more, as we are on a bit of an India kick this month! 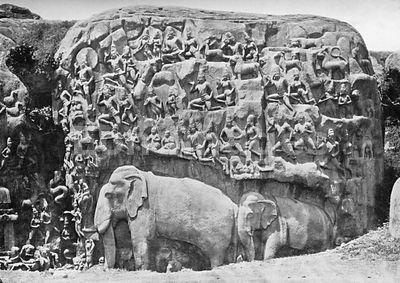 Below is a rock carving from Mamallapuram depicting the paradise of Indra. Mamallapuram is a group of temples in Tamil Nadu, India, built from the 7th-9th centuries AD, that features scenes from the Sanskrit epic the Mahabharata. It is a UNESCO World Heritage site. 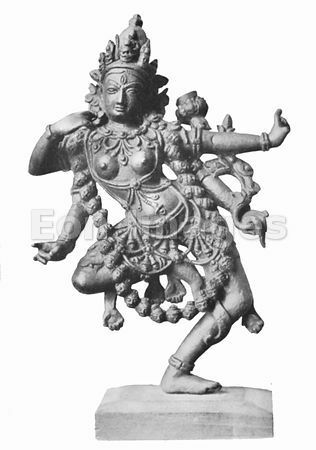 We recently added several interesting illustrations to our Hinduism gallery. This set was done in the mid-1800s, and the pictures appear to have been hand-colored. 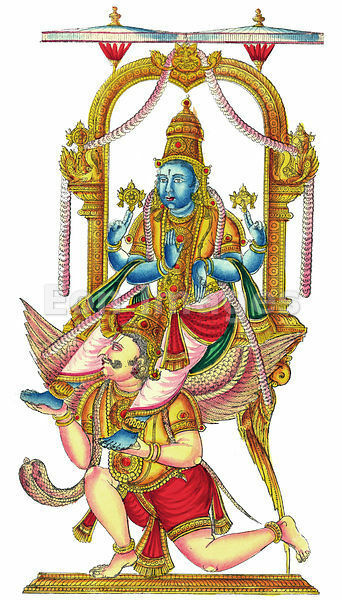 This is an image of Vishnu, considered the preserver of the universe, and part of the Hindu trinity (or trimurti) that includes Brahma and Shiva. 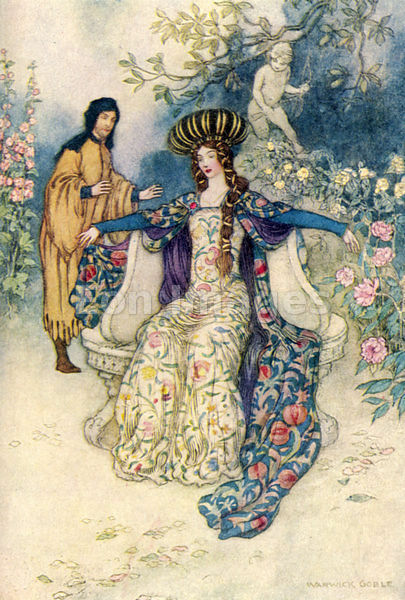 Last week we expanded our collection of Warwick Goble artwork by adding the illustrations from a 1912 edition of works by medieval English poet Geoffrey Chaucer. Images (available as 300 dpi jpgs) include scenes from The Canterbury Tales. Depiction of scene from Chaucer poem "To Rosamond."